Teaching STEM concepts makes for incredible classroom learning adventures. Ultimately you want to make its subjects both engaging and accessible enough for your learners to understand. That’s the goal at least, and coming up with STEM learning scenarios that excite them is a reward unto itself. It takes imagination and innovation to give our kids interesting challenges for learning STEM subjects, and we've got just the thing. 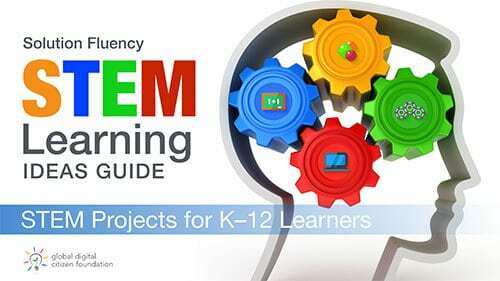 Here's a brand new FREE guide called the STEM Learning Ideas Guide. It features 12 awesome projects for science, technology, engineering, and mathematics to choose from with selections for primary, middle, and senior grades. STEM learning can be an absolute blast with challenging and rewarding projects to give to your learners that let them hone their STEM skills for the world beyond school. All of these STEM learning scenarios are customizable and scalable for any grade level. They’re also cross-curricular in nature, and can be adapted to other subject areas. As teachers, doing what we can now to blaze the trail for STEM education in the future will benefit our students and the world immeasurably. What benefits our students ultimately benefits both the present they are experiencing and the future they will inherit. And it’s great when everybody wins. So it's time to get your STEM on—download the free STEM Learning Ideas Guide today and get busy working with the awesome STEM learning scenarios inside. These lessons go great with the resources in the Tools for Teachers STEM book. And there's no better place to begin building your new STEM lessons than with the Solution Fluency Activity Planner. Get the new STEM Learning Ideas Guide now from the GDCF!